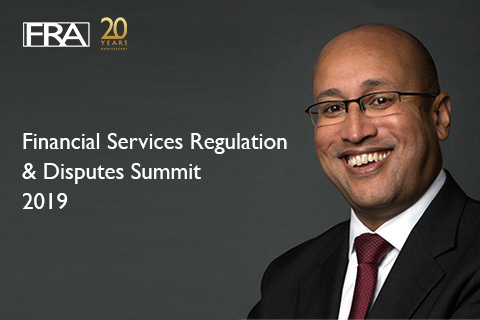 Last week FRA Director, Edward Nkune, attended the Legal Business Financial Services Regulation and Disputes Summit. This networking event brings together leading disputes specialists from private practice, the judiciary, regulators and in-house legal departments at financial services companies. Sessions covered included: A decade of post-crisis banking litigation – lessons, reflections and fault lines; Having the right dispute resolution strategy and are you cyber ready for the regulators? Future trends may see banks fighting more cases, rather than settling litigation to provide certainty to shareholders. Especially with respect to regulatory enforcement. FRC have upped cases (either section 166 reviews commissioned or enforcement actions taken) as a result of increased reporting to the regulator. From an FCA perspective this is still designed to encourage better behaviour. Attitudes have changed over the last ten years and it is now not unusual to sue a bank. Competition issues aren’t intuitive for banks. Unlike fraud where bad actors understand what they are doing, it is hard to get front line bankers to understand that some of the conversations they are having with their peers are inappropriate. The Netherlands are an upcoming location for an increase in class actions. The National Cyber Security Centre which was created in 2016 as part of the Government’s five-year cyber security strategy presented on some of their capability. Stressing that they act in a purely advisory capacity to help make the UK the safest place to work on-line. Their expertise stems from their capabilities along with their access to intelligence (SIGINT) from GCHQ of which they are a part. A new trend in technology disputes are likely following on from “AI” apps being created by the business side of companies without sufficient Legal sign off. The creation of new actions that are taken automatically, for example, making a decision on a loan application. When a human makes this kind of decision they look at the surrounding facts of a particular application. An app can look at all data across the loan provider and is therefore susceptible to liability in one central area. For example, bias. This brings liability up the decision making chain for the bank. Blockchain transactions also provide increased areas of liability. Whilst the transaction is protected the name and location of third parties may be unknown. It is also possible that the blockchain record does not mirror real life and cannot be changed. Moreover the blockchain community would argue that it shouldn’t be changed even if it is wrong. If you are a regulated entity, supervision requires that an investigation is conducted to understand any potential bad behaviour. With the concerns around privilege still a topic of interest, it is likely that the result will be fewer and fewer interview notes being taken.